1. 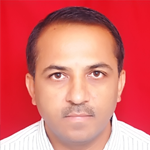 Currently working as Assistant Professor in Mechanical Engineering Department, Sandip Institute of Technology and Research Center, Nashik (MS) since 30 th June 2017. University approval since Dec. 2017, as Assistant Professor in Mechanical Engineering Department. 2. Worked as Assistant Professor in Mechanical Engineering Department, S.C.S.M.College of Engineering, A’Nagar (MS), since 16th Aug 2011 to 29th June 2017. University approval since Dec. 2011, as Assistant Professor in Mechanical Engineering Department. 4. Worked as Lecturer in Mechanical Engineering Department, P.D.V.V.P.College of Engineering, A’Nagar (MS), since 9 th Sept.2002 to 30th June 2008. University approval since Aug. 2005, as Lecturer in Mechanical Engineering Department Worked as Incharge Workshop Superintendent since 12th Dec.2003 to 10th Oct. 2008. 5. One year work experience as Design and Project Engineer at Vimson India Engineers, Pune Recognized PG Teacher: University of Pune, Pune. Ph.D. (Mechanical Engineering ) June 2018, R.T.M.N.U., Nagpur.